Lake Mead has dropped to a historic low with a Colorado River shortage declaration looming as soon as the next couple of years. Arizona's water managers have planned and prepared for a Colorado River shortage for decades. What worries them are projections showing that after a shortage is declared the levels in Lake Mead could swiftly fall and jeopardize the overall health of the Colorado River. To avoid that scenario, Arizona is actively working to implement measures to shore up Lake Mead and negotiate with its neighbors and the U.S. Bureau of Reclamation. Last week, the Arizona Department of Water Resources (ADWR) and the Central Arizona Project (CAP) held a joint briefing to highlight Arizona's actions to prepare for a shortage and push back a water crisis for Arizona. Arizona depends on the Colorado River for about 40 percent of its water supply. 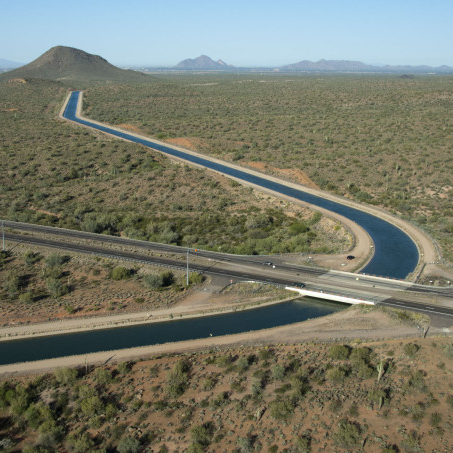 The 336-mile Central Arizona Project (CAP) canal transports the water across the state to farms and cities in Maricopa, Pinal and Pima counties. A 16-year drought on the Colorado River is exacerbating the fact that the Colorado River is already over allocated among the seven Basin States. Arizona knew this day was coming and prepared for shortages. For example, AMWUA member cities are not solely dependent on Colorado River water. Their supplies also include water from the Salt and Verde rivers, recycled water, water stored underground, and groundwater. The state has stored an additional 3.4 million acre-feet of water underground, or about two years worth of water delivered through the Central Arizona Project canal. Lake Mead sits behind Hoover Dam and is the largest reservoir in the United States. It holds the Colorado River water that is delivered to Arizona, California, Nevada and Mexico. A shortage is declared when Lake Mead reaches an elevation of 1,075 feet per a 2007 agreement among the seven Colorado River Basin states. (The Basin states are Arizona, California, Nevada, New Mexico, Colorado, Utah and Wyoming.) The lake is currently hovering near the 1,075-feet level. Under the laws that govern the Colorado River, the Central Arizona Project in Arizona takes the first cut in a shortage. While Nevada also would be impacted by a shortage, California can continue to take its full water allocation. The concern for Arizona, California and Nevada is that the U.S. Bureau of Reclamation’s modeling of the Colorado River shows Lake Mead has a one in ten chance of dropping even lower - to 1,025 feet - by 2020 and a 25 percent chance of reaching that point in 2023. At 1,025 feet, the U.S. Secretary of the Interior can step in and take additional action to protect Lake Mead, including re-prioritizing deliveries among the Lower Basin states. This uncertainty could mean larger cuts for Arizona. It also would mean that California could have to take an unknown cut. Growing risk and uncertainty have caused Arizona’s water managers to roll up their sleeves. Arizona has been negotiating with California, Nevada and the U.S. Bureau of Reclamation to propose a plan that avoids the uncertainty of allowing Lake Mead to fall below 1,025 feet. Under the proposed deal, Arizona and Nevada would voluntarily leave more water in Lake Mead. One of the most significant terms of the proposed deal is that California has agreed to take voluntary cuts should Lake Mead reach 1,045 feet. That avoids the unpredictability of the Secretary of Interior’s actions toward California should Lake Mead fall to 1,025 feet. Taking an earlier voluntary reduction would be a preventive measure to protect the health of the River for Arizona’s future. The action would slow the lake’s fall and improve the odds of keeping it above the 1,025-foot level. Farms and cities would have greater certainty about their Colorado River supply. More importantly, it would avoid a sudden, unmanageable water crisis with a solution dictated by the federal government. Arizona hasn’t agreed to anything yet and we don’t know how these voluntary cuts would affect Maricopa County’s cities. This summer the Arizona Department of Water Resources (ADWR) is conferring with various water supply managers, including cities, farmers and Indian communities, to put together an agreement to implement and absorb the voluntary cuts among all sectors. The goal is to reach a consensus and develop a state plan. It is an opportunity for Arizona to expand its history of sound water management through collaboration for the overall good of the state. It is important to note Arizona already has been making significant strides in keeping water in Lake Mead. These efforts have helped to push back a shortage declaration. The Central Arizona Project—along with support from agriculture and municipalities—has engaged in voluntary efforts to preserve water in Lake Mead. These combined efforts have stalled a shortage declaration by raising the lake’s water level by 5.5 feet. Colorado River and Lake Mead are at a tipping point, but Arizona’s water managers are both optimistic and realistic about what’s ahead. Whether the plan moves forward or another one is developed, Arizona is actively addressing the problems and figuring out solutions to avoid the risk of a future water crisis.